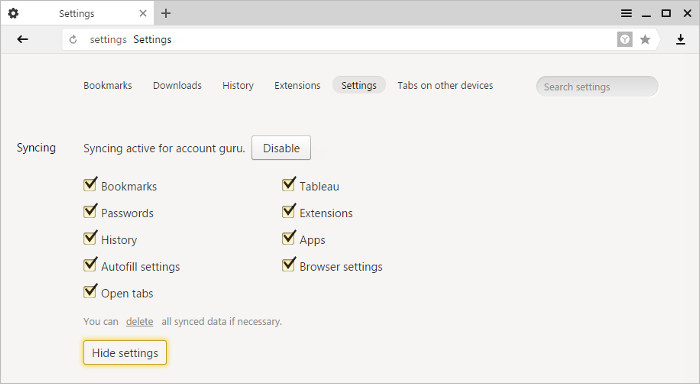 Syncing lets you save your main browser settings and personal data on a designated Yandex server. All information is transmitted to the Yandex server over a secure channel. Passwords are sent encrypted. Access to your data on the server is protected by the same authorization system as on other Yandex services. How do I enable syncing? Note. Only enable syncing on your own devices. When using someone else's device or a shared device, it is better to use Incognito mode. Bookmarks, passwords, history, plugins, and autofill forms are synced by default. Use the password manager on your synced devices (automatic entry of passwords, encrypted password vault, and recovery of website access if you forget your master password). View open tabs, bookmarks and sites that are saved to your Tableau on your synced devices. Configure the browser similarly on all your devices. Recover passwords, bookmarks, tabs and browser settings, even if something goes wrong with your device. How often is data synced? After you enable syncing, data will be synced each time you change data that is stored on the server. For example, when you add a bookmark on your computer, the browser sends it to the server and simultaneously downloads all the changes you've made on your other devices since the last syncing. Attention. If your browser has multiple profiles, make sure you are in your own profile before syncing (otherwise you might mix your data and settings with the data from someone else's profile that is currently active). Sign in using a permanent password. Use two-factor authentication (access your account via one-time passwords). Register on Yandex by clicking the Create account link. Log in to Yandex via your social media account in VK, Odnoklassniki, Mail.ru, Facebook, Twitter, or Google (click a relevant social media logo). In this case, a Yandex account is created automatically. Click the Enable syncing button. Click the Change settings link and indicate which settings should be synced. At this stage, the browser will offer to install an app for working with — a service that stores your files on Yandex servers free of charge. If you have already installed this app, the browser prompts you to turn it on, so you will be able to store browser files on Yandex.Disk. Two-factor authentication offers greater account security than traditional passwords. With the traditional type, you must create a complex password, remember it, hide it from others, and change it frequently. Even if you take all these steps to protect your traditional password, it is still vulnerable to things like viruses that record your keystrokes. With 2FA, protecting your account is much simpler: you just need to remember a four-digit PIN code and have access to a smartphone or tablet where you have installed the Yandex.Key app with your account. Open the Yandex.Key app on your smartphone (you can install it from the App Store or Google Play). On the Sync page enter your username and one-time password from the Yandex.Key app. Note. If you haven't registered on Yandex yet, click the Create account link and follow the instructions. After registering, disable two-factor authentication. Note. The first time you turn on device syncing, it may take from several minutes to half an hour. The data is downloaded gradually to avoid slowing down the browser. Click → Set up sync. Turn on options that allow you to sync only the data you need. Note. The cache does not sync. Credit card numbers that are used when forms are autofilled also do not sync. Attention. After the data has been deleted from the server, no one can recover it. Do not delete your synced data if you just want to stop syncing a computer you no longer use. In this case, disable syncing for the computer, and then manually delete passwords, history, bookmarks, cache and cookies from it. Click the delete link under the options in the block. In the Would you like to delete this information? window, click Delete to confirm that you want to delete all account data from the synchronization server. After that your data is deleted from the server. During the next syncing session, it will be deleted from all synced devices linked to your account.